As the regional aircraft market in the United States is mature, there is no further growth and future aircraft orders will be used to replace older aircraft in service. Those who still think that the scope clause limiting regional aircraft could be revised to increase the size of aircraft and their number will have to change their mind, because the first echoes on negotiations between airlines and unions have begun to filter. In terms of revising the clause on the upside, it is a firm no from the unions. In fact, it is such a sensitive subject that executives from the three major American companies avoid talking about it publicly because the don’t want to upset their pilots. The current situation is such that the scope clause will be maintained until at least 2023 and most likely until 2027. Too bad for the MRJ that do not meet this famous clause. Ten years ago, the major American airlines began to review their service offer on international flights to offer a level comparable to what European and Asian airlines offered. Then they took care of the domestic and continental flights carried out mainly by single-aisle planes. It is now the turn of the regional planes to see their layout be reviewed in order to offer a passenger experience that meets todays requirements. If regional aircraft account for only 10 to 15% of the revenues of major airlines, they are the ones who bring 30% of passengers traveling on international flights. Poor service and poor comfort on regional aircraft can therefore cost many passengers on international flights. The CRJ-550 is arriving when the oldest 50 seats regional aircraft will have to undergo an upgrade or be removed from the fleet. Simply upgrading the cabin of older regional aircraft does not improve comfort while maintaining the same number of passengers. The conversion of the CRJ-700s into the CRJ-550 will therefore make it possible to have 50-passenger planes with a larger cabin offering three classes and enough space for all. From 350 to 400 used CRJ-700s may be converted, which means that Bombardier is not expected to win an order of brand new CRJ-550 within the next two to three years. But the conversion of CRJ-700s that can carry from 66 to 70 passengers will leave a void that will have to be filled, at which point the airlines will have to order CRJ-900s with a three classes cabin that contain from 66 to 70 passengers. Since the CRJ-550 will be equipped with the new Bombardier atmosphere cabin and its cockpit is the same as that of the CRJ-900, the communality will allow Bombardier to win orders. To that it will be able to add new CRJ-550 orders when there will be no more CRJ-700 to be converted to replace the old regional 50-passenger aircraft. 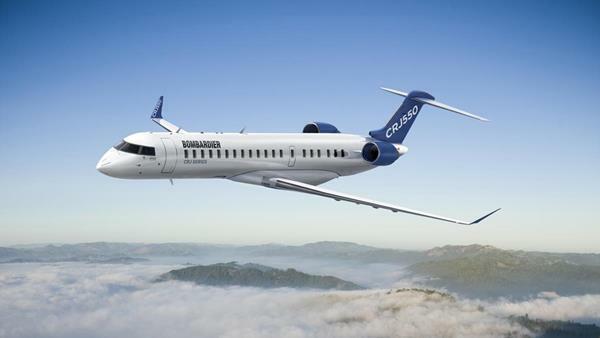 With the arrival of the CRJ-550, Bombardier is the only OEM that offer a scope clause regional aircraft family. It is therefore through a domino effect that Bombardier should obtain more orders for the CRJ-900 in the United States.